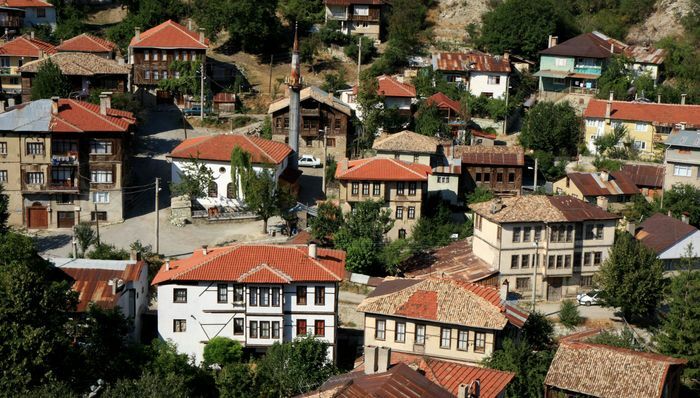 Mudurnu offering its cultural legacy and historical urban structure to the economy with the tourism due to the cooperation with the Governorship of Bolu. the Union of Historical Cities. CUKUL and the Chamber of Architects conducted and still conduct these activities without permitting the rentier economy to spoil the tourism. Mudurnu. one of the examples showing the conscious practice of tourism in the sustainable development is not only important with its mansions but also with its cultural and historical legacy. The past of Mudurnu dates back to Bithynians in 2000 BC. The names of Komopolis. Muderlu, Madra Metrani, Mederni and “Moderna” originating from the daughter of the Byzantine Prince have been transformed to the current Mudurnu. Mudurnu which had been an important settlement in the Middle Age due to its location on Silk Road was annexed to the Ottoman in 1307 by Samsa Cavus It had been the production center of “needle” of the Ottoman and supported the National Independence Army; it provided an important strategic support to the Nationalists since it cut off the communication between the rebeilioous regions. In Mudurnu, one of the districts providing the best conservation for the cultural and historical legacy until today, Yildirim Beyazit Mosque, Yildirim Beyazit Turkish Bath, the market where the tradesmen make still “Akhiprayer” each Friday, the shops selling the traditional handicrafts and the streets are worth visiting. Babas and Sarat thermal springs are located within the district borders of Mudurnu situated between Ankara- Bolu-Istanbul. 15 km. away from Abant Lake, 28 km. away from Sunnet Lake, 40 km.away from Suluklu Lake and 38 km. away from Karamurat Lake. Mudurnu surrounded with magnificent forests is also one of the important hunting centers of the hunting tourism. In the district whose economy has been transformed following the economic crisis, the conscious tourism in-vestments started with the leadership of the municipality have been a matter of interest for the private in-vestment due to the economic income providing emp-loyment. On the other hand, the natural agricultural products are marketed due to the tourism activities. The house wives started to sell souvenirs. The phrase “Mudurnu resembles its mountains. It gives out a sound but it cannot move, it waits that you go to it” is no more valid; now, Mudurnu including the mountains gives out a sound with the tourism so that you go there… Contact. The Municipality of Mudurnu, tel: (0.374) 421 30 31. The Mayor of Mudurnu Mehmet Karakasoglu playing a leading role in shaping the future of the district. This article is published for EnmarBg. For more interesting information about ancient Bulgaria tour, please visit ancient Bulgaria tour.